Make way for the big kids birthday party attraction. The edible piece of art, also known as the birthday cake. Many parents miss the mark when they go with a simple sheet cake. Sure, sheet cakes have their place, but it shouldn’t be a birthday party, unless, of course, that’s what the birthday girl wants or it’s not in the budget. Take a look below at five of the most fun birthday cake ideas for kids birthday parties. Then, take a crack at it yourself if you dare or order it at your local bakery. If your child loves food, or even if the party theme is “Backyard BBQ” this may be the cake for you. 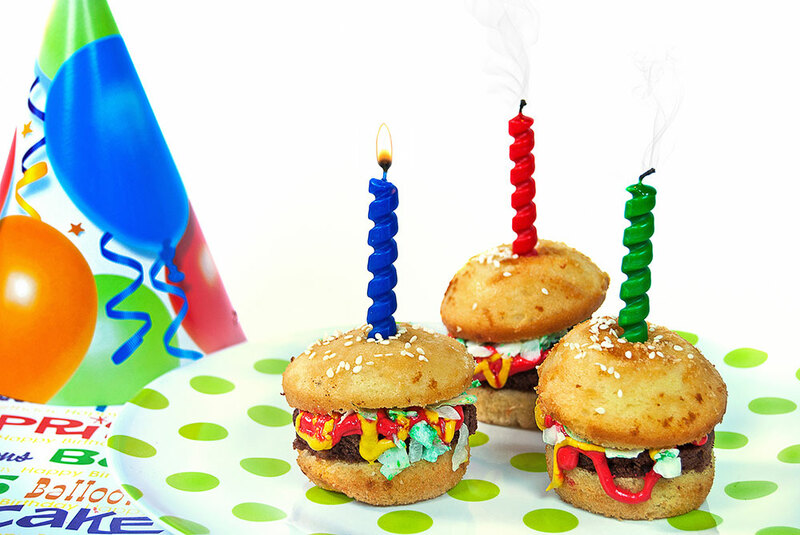 Cake and colorful frosting combine to form a birthday cake so artistic and fun you will think it’s an actual burger, until you bite into it. Stun guests with fluffy cake layers that look like “burger buns” and of course the “burger patty”. Icing and fondant will both have their rightful place upon this masterpiece as the “tomatoes,” “ketchup,” and “mustard”. Tall, moist, and delicious, yet artistic and creative, you can’t go wrong with this faux burger cake. You may have seen this one before at a “Princess” or “Barbie” themed party. Your child can even use her favorite doll, as long as she’s made of mostly plastic for post-party clean-up purposes. If you haven’t seen this fun cake before, the basic idea is that a cake is made and decorated to look like the bottom of a ballgown. You know, the kind of ball gown they used to put hoops in. This makes it plentiful enough to feed a small army of children. The doll is inserted into the top of the cake to make the dress complete. As a bonus, you can purchase a new doll to put in the cake and your child can keep it afterwards to remember the day. You knew this one was coming. LEGOs have made a huge comeback. Actually, they never really left, they just kept evolving with the times. New generations, new fads, new characters. But one thing has always been true about LEGOs–they are awesome! And so is eating them, assuming they are edible. Otherwise, it’s a bit painful. Hence, the LEGO cake. This one is a fairly easy DIY cake, if you’re into that sort of thing. Make cake pieces into giant rectangles and squares. Then, either frost them or cover them with fondant using traditional LEGO colors. Finally, piece them together to look like a stacked masterpiece and add tiny circular pieces of fondant to the tops to really finish them off. We all know that kid who hates cake but loves cupcakes. It makes no sense, but we choose our battles wisely. Well, for the parents of that child, this “cake” is a great option for you and it’s totally customizable to your child. First, decide what fun image you want to display on the cupcakes, either piped with icing or printed with edible icing photos. It could be whatever your daughter likes–a piece of art, a character, a theme, or just a rough idea of a scene. Then, if you know you aren’t that skilled, find a bakery that can make the vision come to life. They will arrange the cupcakes on a flat surface and decorate them to your liking. It will look like a whole cake, but won’t require any cutting. Just pick a cupcake, pull and enjoy! Say what? I know. Perfection, right? You said it! This cake looks sweet, tastes sweet, and satisfies a whole crowd. Again, you may want to bet on your local bakery to pull this one off. Whatever candy bar your child loves the most, make it into a giant cake. You can make it look like the wrapper is partially peeled back. There may be a bite taken out of it, or the wrapper could be completely gone! That part is totally up to you. Make your child’s birthday stand out. Make it more fun. Make it more flavorful. And do all that by choosing one of the cakes above. None of them will steer you wrong when edible birthday fun is your goal. And, for a special, loving touch, try your hand at doing it yourself. Okay, who are we kidding. Eliminate your stress and call the bakery. If you handle getting the cake we’ll take care of everything else for your kid’s birthday party. See what we have to offer. Amazing. I really liked all these cake ideas. Definitely trying this for my kid’s next birthday party! Thanks for sharing!